A gorgeous new adult coloring book from author Millie Marotta, whose books (Animal Kingdom and Tropical World) have sold more than five million copies worldwide! 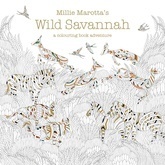 Millie Marotta is one of the most popular creators of adult coloring books, and this beautiful volume features stunningly sophisticated patterns inspired by the savannah. Her intricate black-and-white drawings capture myriad flora and fauna found in that breathtaking landscape, including elephants, rhinos, zebras and ostriches. The high-quality stock is perfect for color pencils, as well. Marotta's adult coloring books, always filled with intricate patterning and detail, invite adults and older children to add their personal touch to each stunning drawing.